Situated in Central Pattaya, Access Inn Pattaya is a basic 3-star hotel to experience Pattaya and its surroundings. Pattaya's excitement is just outside the door, and even Walking Street is nearby. 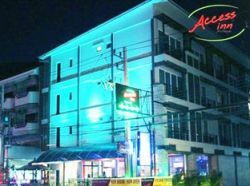 Access Inn Pattaya offers clean rooms with essential amenities. Golfers staying at Access Inn enjoy free Wi-Fi throughout the property. Non-smoking rooms are available. However the public areas all allow smoking. Access Inn Pattaya is one of many choices for golfers in Pattaya.